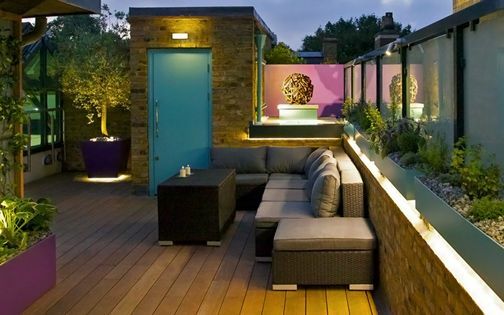 We designed this lush Butlers Wharf roof terrace alongside three other penthouses, atop a converted wharf in vibrant Shad Thames. The proximity of Tower Bridge presents a breathtaking vista from the living room, forming an integral part of the ambience throughout the residence. 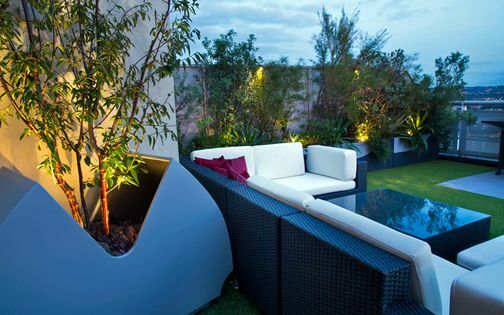 With four sheltered outdoor courtyards facing both north and south, the extensive scope enabled an eclectic mix of luscious foliage to suit the clients' lifestyle and minimalist interior design. 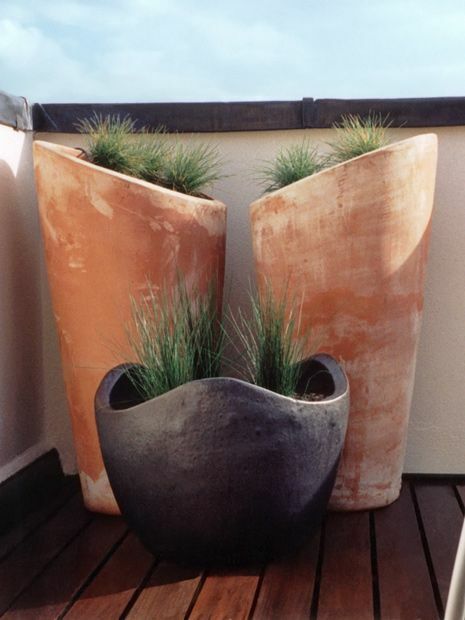 The ceramic pots add warmth amid imposing scale outside the lived-in kitchen adjoining the south-facing roof terrace. Blue fescue and Pencil grasses are displayed in a balanced composition, where low-lying tufts accentuate the great height of their terracotta vessels. We planted tall Olive trees, Irises and copious culinary herbs to utilise in the family's cuisine. This minimalist layout design ties in cohesively with the Teak deck while soaking up the sun, sheltered from westerly river airstreams. 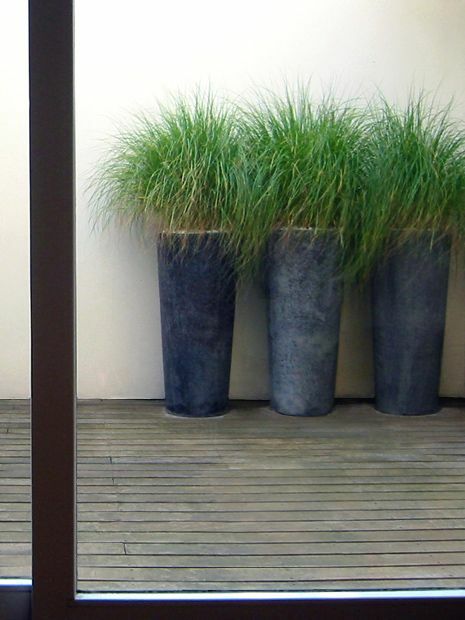 The rooftop terrace's effortless outline, consisting of three pots in two designs, is mirrored on either side of its elevation, defining relaxed modern symmetry to engage our Dutch clients. While three roof terraces form sheltered courtyards, providing internal atrium views, the north-facing balcony at the top of the duplex is positioned opposite Tower Bridge. The east view unveils an expansive Canary Wharf panorama, yet the angle encapsulating Tower bridge to the west and its eye-level height enables a remarkable up-close vista. This thriving river setting amid a towering bridge and its dynamic city backdrop instils a captivating sense of place – defining Butlers Wharf's waterfront quintessence. 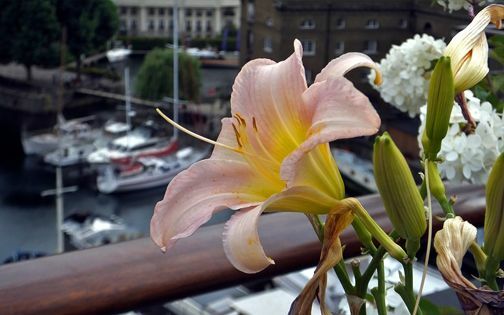 The Illyrian Iris from Croatia feels at home here in Butlers Wharf, soaking up afternoon sun and enhancing the Tower Bridge view under the blue sky. Underplanted with evergreen Sweet flags, this perennial re-emerges in spring, producing fresh luscious foliage which forms an elegant architectural see-through veil – daintily framing an expansive city landscape. 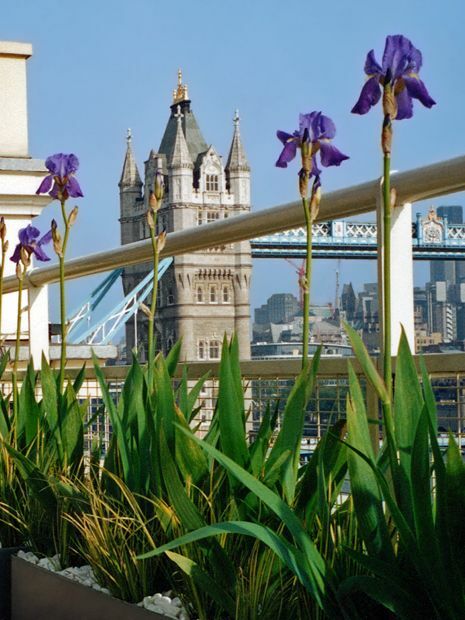 Easy to cultivate, the Iris complements an invigorating terrace planting scheme; its bearded petals aerially observed along Tower Bridge and the surrounding bustling riverscape. 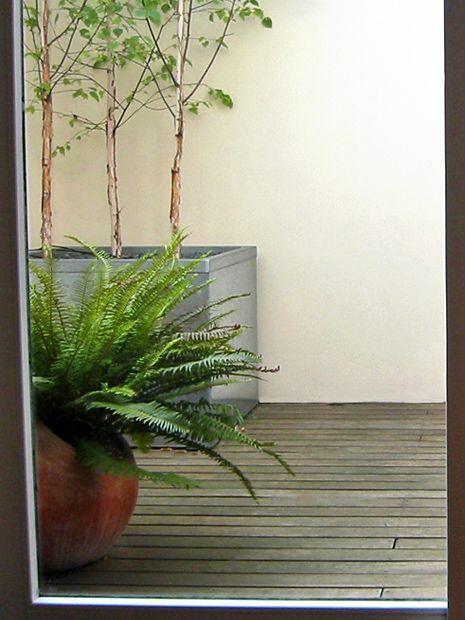 The lower courtyard by the apartment's entrance is mostly shaded, and while forming an internal atrium viewed from the lounge and guest bedroom, its setting is North American with Sword ferns and tall Silver birches. 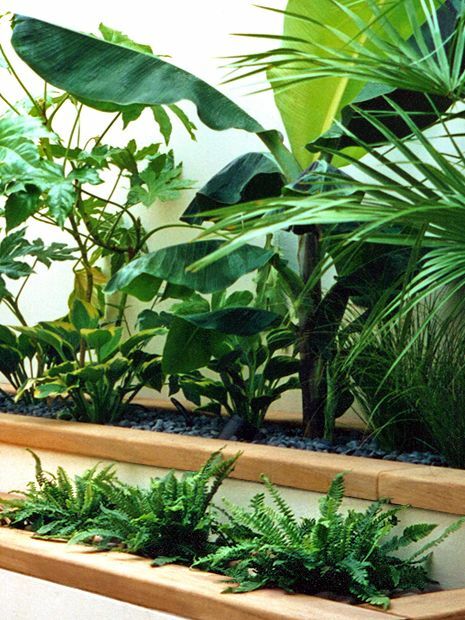 A trio of Betula jacquemontii trees is juxtaposed alongside evergreen Polystichum munitum, where the Ferns' round, tilted terracotta planters infuse further contrast in front of the trees' large-scale galvanised steel planter. This clear distinction in colour, form, material, scale and texture is reminiscent of Shad Thames and Butlers Wharf's historic dockside conservation ethic. 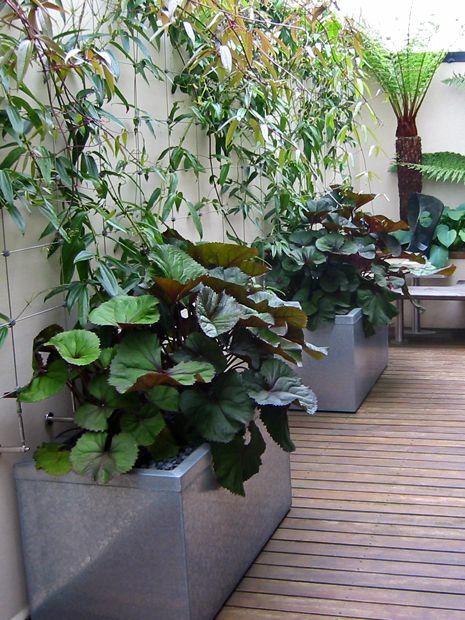 In the lower north terrace, the stainless steel green wall system forms an architectural display in its own right. 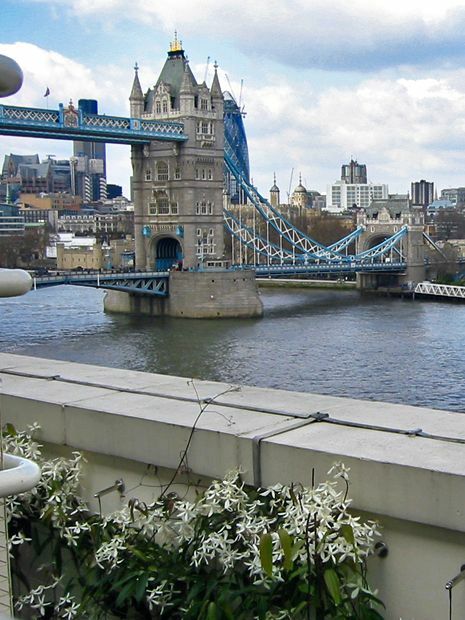 Spanning the entire 10-metre length of the rooftop, and at 3-metre height, this elegant structure was sensitively designed to support three Clematis armandii specimens which cover the wall. 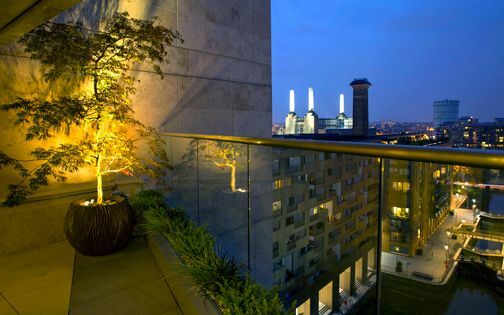 This lustrous construction material coincides with many of the penthouse's architectural fittings, as well as the custom-made bench uprights and bespoke sculpture plinth. 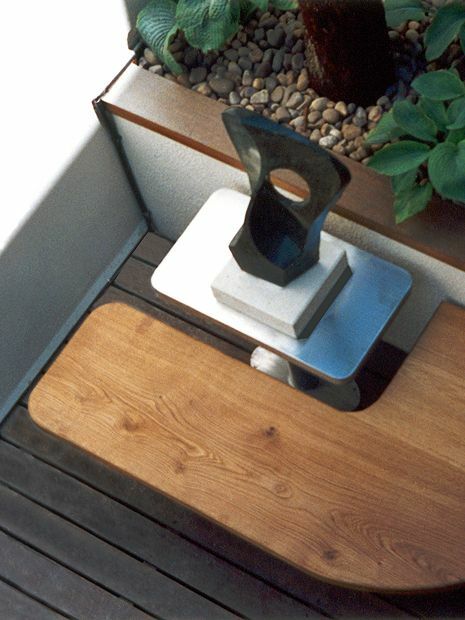 The Welsh oak bench was custom-built in dynamic curves to balance the main roof terrace's linearity, while enhancing the upper balcony's aerial view. A Blanc de Bierges circular concrete table fits within the bench's straight section, where a bijou opal stone sculpture is placed behind the seat. Enveloped by lush Tree ferns, luxuriant Hostas and leafy Sasa bamboo, this asymmetrical composition forms an intimate, cosy haven outside the master bedroom. The jungle-like vegetation thrives in a humid microclimate, producing sculptural silhouettes. A trio of graceful Fountain grasses, Pennisetum alopecuroides, is featured in tall, round terrazzo pots along the sunnier corner of the sheltered entrance courtyard. Remaining evergreen in most years, these architectural grasses generate eye-catching feathery plumes; useful for indoor displays. The grasses' soft foliage sways gently in a light breeze, contrasting the stillness of Silver birch tree trunks. 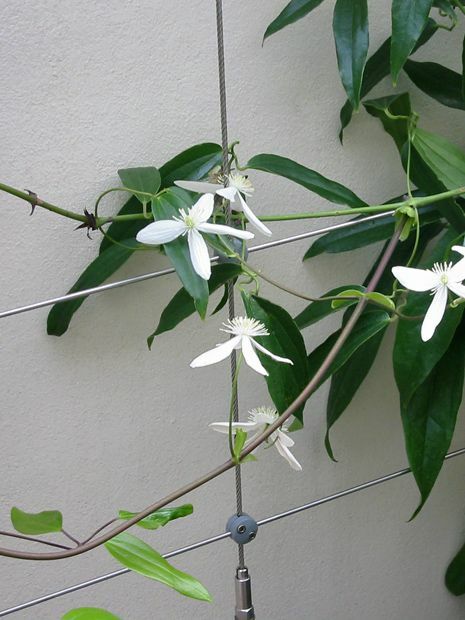 The evergreen Clematis armandii is a vigorous climber. 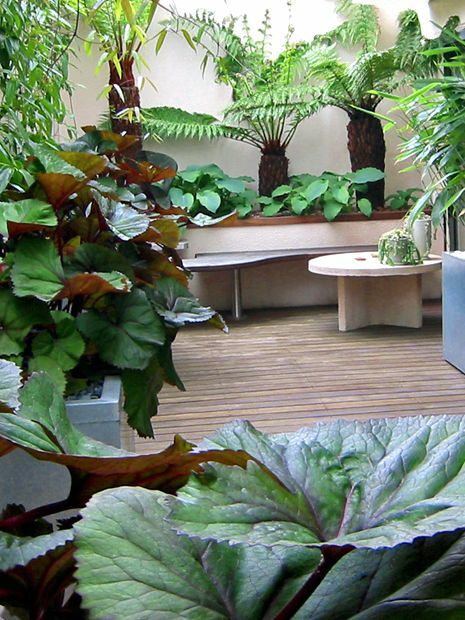 We planted three specimens in the lower roof terrace, where the walls form an ideal, solid backdrop in scale and colour. The Jakob stainless steel architectural system defines a contemporary matrix of minimalist detail design, enabling the climbers freedom to spread their foliage in abundance. 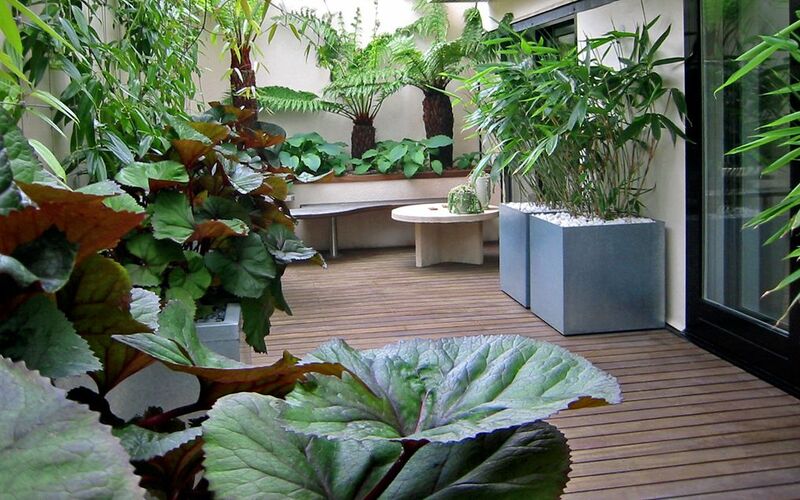 The dainty white flowers and oblong glossy leaves produce an immersive, lush tropical jungle rooftop ambience. 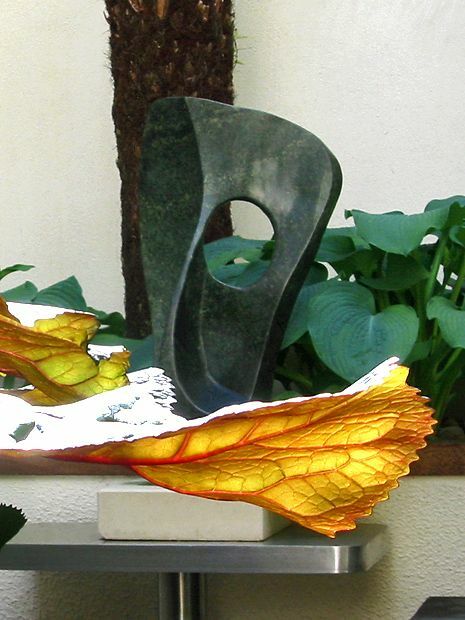 The opal stone modern sculpture echoes the foliage outlines in the lower shaded roof terrace adjacent to the master bedroom. 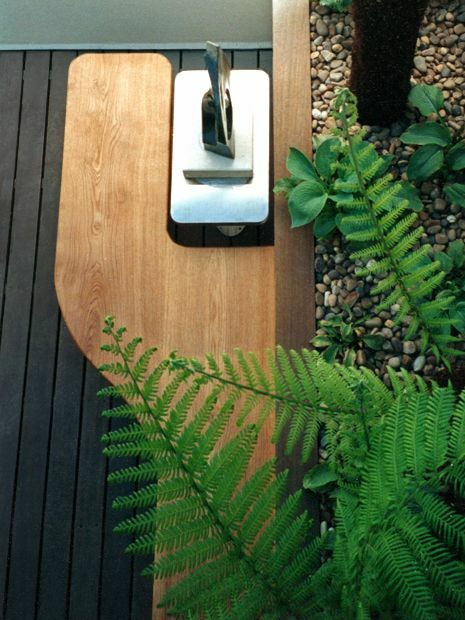 Displayed above a stainless steel plinth, the small-scale sculpture is enfolded by the fronds of Tasmanian Tree ferns. The podium's proportion and lightweight profile were tailored to add contemporary contrast, while reflecting daylight in the terrace's shade. Abundant Ligularia leaves diffuse sunrays through their translucent midribs, mimicking the artwork's contours with vigorous, crimson Leopard plant essence. Over the last three decades, Shad Thames has been transformed into a bustling centre of architecture, art, design and culinary hideaways. Countless logistic constraints encompassed comprehensive challenges when working here, within a limited access pedestrian zone, yet, Shad Thames' scenic river atmosphere sustains an inspirational buoyant location. We created a refined scheme to enhance our clients' visits in London, where an engaging design complements the dynamic views and zeitgeist of this Shad Thames urban terrace riverside setting. 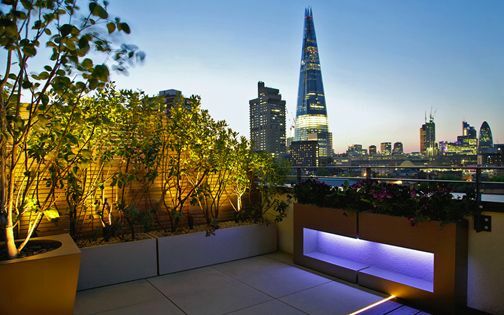 The success of this project led to three further roof terrace design & build schemes at the top of Butlers Wharf, where each penthouse suite presents diverse layouts and unique outdoor spaces. 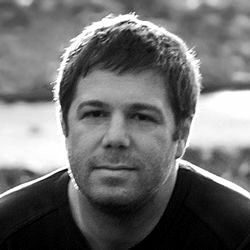 Teaming up with the site's architect was beneficial in gaining clear insight of the building's fabric, history and structural capacities throughout the design process. With an extensive new concrete and steel framework, retrofitted onto an inherent wharf edifice, it was vital to include lush foliage, stems, trunks and petals to soften an architectural landscape. 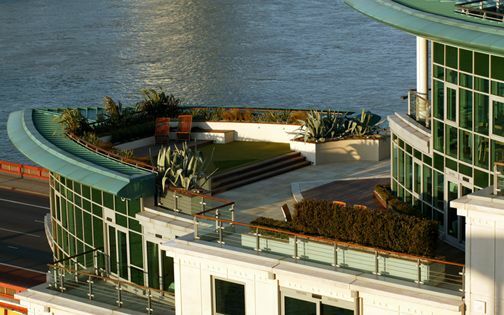 For our clients, this all-embracing rooftop design principle produced a refined, verdant experience of living by the river – in Butlers Wharf.